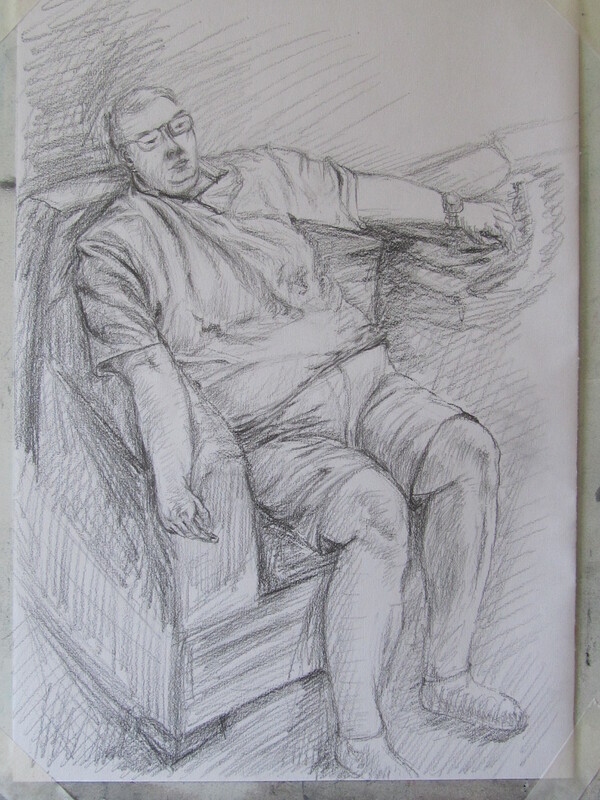 I have been recommended by my health trainer to visit a local drawing society on Fri. 7th July. I was very excited to meet the new artist friends who live close to me and they are such kind people. At my first class, they were happy to be models let me draw to finish this exercise. Then I got my first quick sketch on my A5 sketchbook. He was wearing a white apron for painting watercolour image. I was trying to draw the apron but most of it has been hidden by the table. Second attempt. Conte stick on a large sketchbook. 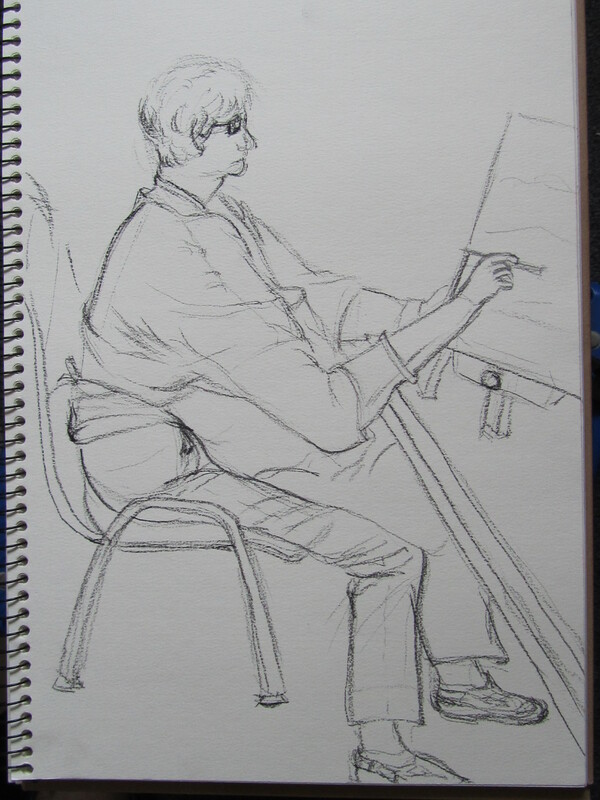 I should draw the figure upper then the foot can get in this image. Is her head small than it should be? Her thighs are longer than they should be then the calfs are much shorter when compared to her thighs. 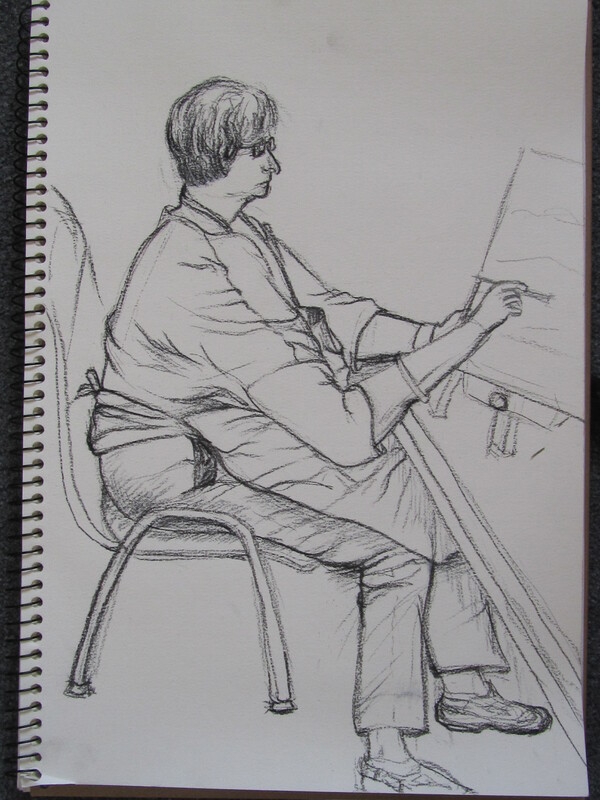 Her right arm put weight on the table but I didn’t draw it right gesture. I am not going to complain because they are keeping moving their bodies when they mixed the colours or stand up to watch other people’s works. Well I was there from 10:00 am to 12:00 am with 15 minutes tea time where I was watching the others. When I got home I corrected it to make it better. After this female drawing, I also practiced a male’s one on A3 white paper by 5B and 6B pencils. Again is this figure’s head smaller than it should be? I will come back to take another look at it. Pencil drawing is too rough for drawing. I am feeling this pencil drawing is a very rough of drawing. I am finished here because I feel that I am not capturing the character of the figures.